The top of the Cubs’ farm system is starting to look more normal. After living in both tails of the bell curve, both having a Top 10 that arguably could have consisted of nothing but league Top 100s and a Top 10 that didn’t have a single Top 100 in the bunch, they are settling back into a place somewhere comfortably under the wider part of curve. Still at the low end, but better. The overall quality of the farm system is trending up, but I think they are still lacking impact talent at the top of the rankings. On the other hand, when the 2019 season opens, every pitcher we talk about today could be in Double A or higher. This season has seen a number of good pitching prospects break out and start flying up the system. I don’t think there is a future ace on the list – again, the system is improving on overall quality but still lacking impact – but there are multiple pitchers who seem as likely as any pitching prospect to have a major league future. The fact that all of today’s pitchers are already this high in the system makes just a little easier to have that confidence. Before we can really call the farm system cured, though, I think we do need to see some prospects break out and establish themselves as potential impact guys. The Cubs’ new number one prospect has arguably done that, but he should have company from both the pitching and hitting side. There are some candidates who could take that next step, including candidates on today’s list, but they still need a little more time. 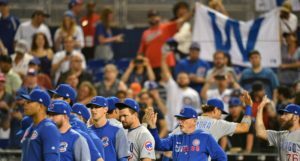 Assuming the Cubs continue to do an excellent job developing bats, and assuming the improvements I think we’re seeing on the pitching side continue and the Cubs begin producing a steady supply of pitching prospects to go with their steady supply of bats, I think the Cubs will still be a bottom five farm system for one more year, but should be sitting somewhere in the middle of the pack when the pre-2020 rankings come out. And from then on I expect it will stay somewhere in that middle range, never again become a clear best system, but never again falling off a cliff either. As always, there will be one more article in the Top 40 series that provides the entire list on one spot, and also take a quick look at a guy I can’t rank yet, but who could shake up this chart in a hurry. As for the Cubs’ new number one over all prospect … I don’t think you’ll be surprised. There really is one obvious choice right now. And the rest of the list? Let’s find out. This has not been a great season for Ademan on the stat sheet, but he looks better than the numbers show. He’s making fairly consistent contact (although the 21.9% strikeout rate is a bit high for a non-slugger in High A), but there isn’t much power behind a lot of that contact. That lack of power leads to a pedestrian Batting Average On Balls In Play of .284 and an overall wRC+ of just 74. At 5’11”, 160 lbs, and 19 years old, though, there is plenty of room for him to add some additional strength without costing him the quickness that makes him an effective shortstop. With that added strength, this left-handed hitter could morph into a .280/.360/.400 type in a hurry. Defensively Ademan should be just fine at short or at second. His ability to stick at either is going to come down to his bat, and how fast he can move up the system will be dictated by how fast he can produce enough with the bat to justify keeping him in the lineup. He has the potential to turn into a solid major league regular, but right now I see Ademan developing into a glove-first utility guy and decent left handed bat off the bench, but it could be 2021 at the earliest before he makes it to Chicago. Leal missed all of 2017, but when he returned to Myrtle Beach this summer he was pitching better than ever. The strikeout rate is up by over 2.00 K/9, the walk rate (which was already good) is down to elite levels, and his infield fly ball rate is through the roof. I mash numbers several different ways to make these rankings, and on most of those models Leal was the best pitching prospect in the system. His numbers and the video we have on him leave little to criticize. Assuming Leal continues to stay healthy as he adds to his workload, he could be in line for a major league debut in the later part of 2020. For now I have him projected as a fly ball heavy number three/four type, but if he keeps up this level of success in Double A next year we may have to rethink that. Roederer offers the promise of being a true five tool player. He has the speed and arm to stick in center, should steal plenty of bases, and appears likely to make enough hard contact to put up double digit homers with a line drive focused swing. 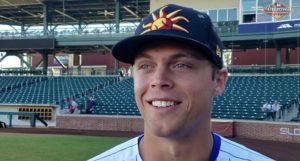 He got off to a very hot start in Arizona after being drafted this summer, hot enough that the Cubs may contemplate letting him skip Eugene and move straight to South Bend next spring. I think Roederer will move as fast as his swing lets him. If the strikeout rate stays reasonable and the hard contact rates stay up, he could be in Double A before his twenty first birthday. I don’t have a ton of data to project on yet, but for now I see him emerging as a quality defensive center fielder who produces in the lower part of the order. Sierra is a big, left-handed masher, signed to the Cubs’ biggest IFA bonus in the class a few years ago, who could be the next slugging outfielder to emerge from the farm system. His strikeout rate is still on the high side, but that figure is down quite a bit from what he showed in Arizona last summer. The walk rate is holding steady, and the ISO has ticked up a bit. Combined, that suggests that Sierra is in the process of learning to cut back on the strikeouts without disrupting his power. He also has seven steals this year, but as he starts to pack more muscle on his 6’3″ frame I think the steals will vanish and the power numbers will explode. Be patient with Sierra. I think he’ll show only incremental improvements for awhile, but at some point the added strength and work on his plate approach and swing will combine and Sierra could emerge as a significant power hitting prospect. It may be 2021 before he starts getting any recognition outside of the Cubs circles, and it will probably another year after that before he makes the majors. Alzolay was on track to make his major league debut in 2018 before a lat injury shut him down for the year. His season numbers after eight starts in Iowa weren’t too impressive, but in many games those numbers were marred by a single bad inning and the fact that he is a fly ball pitching in the Pacific Coast League. 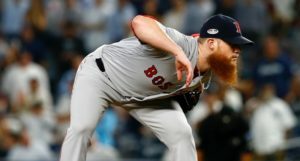 Despite being a fly ball guy, he does generate plenty of weak contact that, combined with what should be a better than average strikeout rate, could let him settle in as a solid mid-rotation starter in the majors. If Alzolay comes back healthy in 2019, he’ll likely be first in line for a shot at Chicago. The 2016 and 2017 draft classes are right behind him, though, so if he needs a little more time to recover in the spring he could be passed on that depth chart. Either way, we should see Alzolay in action sometime next year, and he could be a pushing for a regular rotation slot by 2020. Another relatively safe, high floor pitcher from the 2017 draft class, Uelmen comes in this high for me largely because of his ground ball rate. He has a sinking fastball that lives in the bottom of the strikezone and produces a steady stream of grounders for his infield. The rest of his stuff is still in development, but I expect high ground ball rates to remain a feature of his game for his career. I think Uelmen is as likely as any pitcher on this list to make the majors as a starter, and that is why he comes in this high despite only really projecting as a back of the rotation guy. Still, a back of the rotation who eats 200+ innings a year and produces a ton of grounders in front of an elite defense is a valuable guy to have. He’ll need some time for his secondary stuff to develop, so don’t look for him in Chicago before late 2020. A product of the 2017 draft class, Lange’s curveball might be the single best pitch in the farm system. When the curve is working and he locate it, hitters are basically helpless. He already attacks the strikezone, limits walks, and avoids homers, so the pace at which he moves up the system really comes down to the pace at which he develops his fastball and changeup. He has the upside of a Number Two starter, but a safer projection would put him in the Three/Four range. If the Cubs keep him as a starter (and I strongly suspect they will), I think they’ll be patient and try to maximize that upside. That plan has him pushing for major league roster time around 2020. If they move him to the pen, though, his curve could let him morph into a near-elite reliever in a hurry. Take a solid a defensive middle infielder, add good strike zone recognition, lots of walks, plenty of line drives, and some very good speed. That’s Hoerner. The biggest questions are whether he’ll stay at short of have to move to second, and just how much power he’ll develop. Unfortunately injuries shut him down before we got much of an indicator on either of those things. The Cubs have proven they can develop bats in a hurry, and with his patience and line drive swing I think Hoerner will be on the fast track when 2019 opens. It will be 2020 at the earliest before he is ready to start serving his utility player apprenticeship in Chicago, but if things go right he could leading off more often than not by 2021. When was the last time we saw a starting pitching prospect make Double A a year after being drafted? Thompson works with four pitches, including a curveball that is graded plus and a changeup near that status, and can get outs (not just strikes, but outs) with any of them. The lack of any elite pitch is going to doom him to back of the rotation projections in a lot of circles, but I think the stuff is there for Thompson to emerge as a solid Number Three with some more experience. 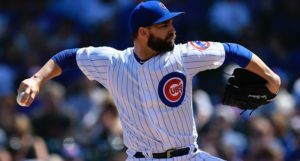 The Cubs rotation is crowded right now, but I wouldn’t be surprised if Thompson pitches his way into major league consideration by the middle of next season. It isn’t common that we find a catcher who, as a teenager, is not only winning praise for his glove but whose bat is also arguably ahead of his glove. If Amaya stays healthy and continues as projected, he could be ready to take a healthy share of the catching in Chicago in two of three years. It remains to be seen just how much power he’ll generate, but I think he’ll easily hit enough to be better than average for major league catchers both at the plate and behind it. Look for Amaya to be a fixture on Top 100 lists until he graduates to the majors, and to start topping ‘best catching prospect’ lists in a year or two.